Moss Lake, part of a bog wetland complex in Moss Lake Natural Area. Photo by Jennifer Vanderhoof. Because of its size (6,000 square kilometers), variety of landforms, and diverse landscapes (marine to alpine), King County includes a large diversity of marine, estuarine, riverine, lacustrine and palustrine wetlands. Although not all wetlands have been discovered, the lowland portions of the county have been surveyed, first in 1983, and again in 1990, for the presence of wetlands and their hydrologic, vegetation and wildlife characteristics. Little similar work has been done for the foothill and alpine landscapes, however, and many wetlands remain undiscovered. In the most recent County wetland survey (1990), some 884 wetlands were surveyed and mapped in the unincorporated areas of King County alone (unincorporated areas are those parts of the county not within cities or towns and not in Federal ownership). These wetlands comprise approximately 8,800 hectares (20,000 acres) and are of several general types, listed in the table below. Table 1. Types of wetlands in King County, including quantity and area. Forested wetland: A forest floor of saturated, mucky soil. Trees found here might include alder, Sitka spruce, Oregon ash, and cottonwoods. Bogs and peatlands: A thick mat of sphagnum moss encircling or covering a small lake or pond containing cranberry, Labrador tea, and bog laurel. Bogs were formed after glacial retreat in pothole lakes; many have been around almost 10,000 years. Wet meadow: Areas that often look like soggy pastures of grasses, rushes, and sedges. Marsh: The classic, and most familiar, wetland type; shallow mix of open water and vegetation that includes cattails, pond lilies, sedges and rushes, and many other types of plant life. Marshes that occur along the marine coastline are salt marshes. The most common type of wetland recorded in the inventory is the palustrine shrub-scrub type. This type is well-distributed throughout the urbanized lowlands of the county and may owe its current abundance to historical beaver activity and manipulations of these wetlands for agriculture. Forest practices, mining, and the effects of land development activities increased sediment and nutrient delivery to these shallow areas and sped the invasion of shrubby vegetation. These wetlands tend to be dominated by two or three shrub species, one of which—hardhack, or Spirea—can form dense, almost impenetrable stands throughout the wetland. These wetlands may also have a ring of willow or red alder surrounding the wetland center. In our few, relatively undisturbed scrub-shrub wetlands, we find a greater richness of shrubs and small trees, even some areas of shallow, open water that provide habitat for herbaceous species, amphibians, birds and small mammals. American beaver are often present (see mammal discussion for how the American beaver significantly contributes to wetland complexity and biodiversity). 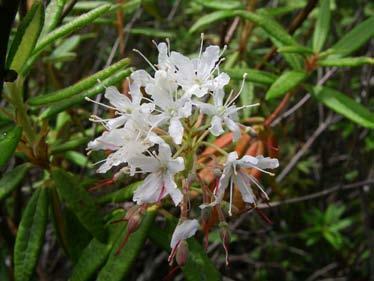 In these wetlands, we may encounter typical small tree and shrub species including cascara, vine maple, crabapple, Oregon ash, red-osier dogwood, and devil’s club. Herbaceous species include veronica, watercress, smartweed, marsh speedwell, water parsley, skunk cabbage, and lady fern. Our most unique and sensitive palustrine wetland type is the bog or peatland. 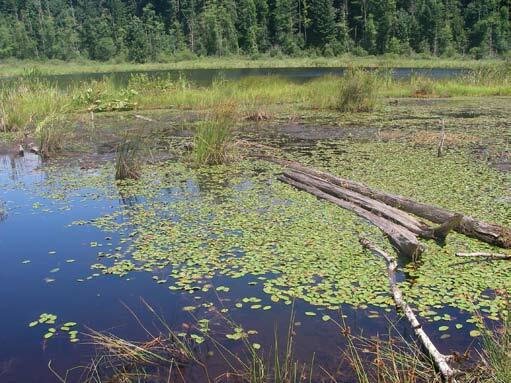 Of the total number of wetlands in lowland King County, 80 have been identified as bogs or peatlands. This type generally owes its existence to the retreat of glacial ice from the Puget lowland some 10,000 to 12,000 years ago when blocks of ice, broke from the glaciers and formed small kettle lakes in the recently revealed landscape. The combination of cool conditions, local hydrology, and acidic and organic soils, favored the growth of sphagnum mosses along the edges of these lakes. The sphagnum moss adds to the acidic conditions, further creating an environment that favors other low pH tolerant plants. A typical, well-developed bog in King County will have hummocks of sphagnum with wild cranberry and sundew growing in close association with Labrador tea, bog laurel and possibly a few stands of cotton grass. Older bogs also contain western hemlock and remnant western white pine, which is especially rare in King County. Many, if not most, of the peatlands identified in lowland King County have been substantially altered by peat mining and agriculture over the past 150 years. Of the lowland peatlands, King’s Lake Bog (a state natural area), Queens Bog, Hylebos Bog, Laughing Jacobs Lake Bog, and the Paradise Lake Bog are our best examples of bogs. Lacustrine wetlands are those associated with the littoral zones (the shallow) edges of lakes and ponds. These wetlands also have emergent vegetation such as bulrushes (Scirpus sp.). Riverine wetlands occur along the edges of rivers and streams, in sloughs and backwaters, and in abandoned bends and oxbows. Estuarine wetlands occur at the interface of marine waters with freshwaters, usually at river mouths, and have plant species adapted to periodic immersion by both freshwater and saltwater. Marine wetlands include saltwater-fringing marshes and backshore wetlands. These wetlands typically have species adapted to the high salinities of marine and brackish waters. Many possess cellular mechanisms to rid their tissues of salt (such as saltgrass and pickleweed). Estuarine and marine wetlands are both discussed further in the Marine Habitats section. During the County wetland inventories, observations were made of plants and animals encountered by the field crews. Although not all of these plants or animals are exclusive to wetland habitats, all have some association with these habitats during their life history, and a few are, in fact, found only in wetlands. Eighteen tree species, both conifers and deciduous, were recorded from wetlands. Of these, the most common are red alder, willow, and black cottonwood. The rarest trees were lodgepole (shore) pine, western white pine and paper birch. Few invasive trees were noted in the inventory although it has been suggested that red alder now occupies more wetland area than it did before Euro-American settlement. Lodgepole pine and paper birch were found only in a handful of wetlands and may be relicts of a cooler northwest. Forty-two species of shrubs were noted, the most common of which are Douglas spirea, willow species, and salmonberry. The least common include three species of huckleberry (found mainly in peatlands), devil’s club, and cascara. Of these, cascara bark was often harvested for its laxative benefits and may help explain the species’ present rarity. Several non-native species show up on the list, most notably evergreen blackberry and Himalayan blackberry, two of the most widespread invasives in all types of King County habitats. Herbs accounted for 161 species observed but almost a third of these are non-native invasives. The invaders causing the most concern are reed canarygrass in wet meadows and shrub-scrub wetlands, purple loosestrife in shallow marshes, yellow iris along sluggish stream, pond, and lake margins, Eurasian water milfoil in lakes, and sargassum, Japanese eelgrass and Spartina in marine wetlands. Even some once-uncommon native plants have become somewhat invasive, especially in the disturbed landscapes of lowland King County. Cattail is one such aggressive species that has spread broadly in the disturbed landscape of urban King County. Over 100 species of birds were observed in wetlands during the inventory and, because the inventory was confined to the lowland region of the county, mid- and high-elevation species would undoubtedly increase this total when considering all wetlands. Ducks and geese accounted for 30 species, wading birds (herons and egrets) for 9 species, coots and grebes for 6 species, shorebirds for 5 species, with perching birds, raptors and seabirds making up most of the remaining species. Among the more common and easily observed birds of King County wetlands are mallards, coots, Canada geese (many flocks, which are now year-round residents), red-winged blackbirds, great blue herons, and dark-eyed juncos; among the least common and unusual are loons (mostly winter salt-water visitors), wood ducks, American bittern, Virginia rail, green-backed herons, and black-crowned night herons, black brant, and western grebes. This last species was once far more common in our winter estuarine waters. A few non-native bird species have been recorded from wetlands as well but do not seem to pose as great a threat to native biodiversity as invasive plants. Brown-headed cowbirds, European Starlings and House Sparrows, all widespread species, were commonly observed during the inventory. 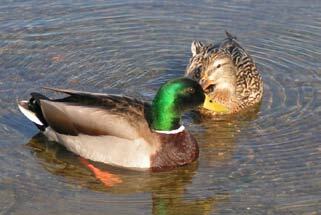 For more discussion of bird species, see the Wildlife section. Thirty-five species of mammals have been recorded in King County wetlands: 14 species of rodents, 12 species of carnivores, 7 species of insectivores, and 2 species of herbivores. The most unexpected was the observation of a single masked shrew in 1988. This species is mainly distributed in the boreal forests far to the north of King County. Other rare species noted include beaver (once very common), muskrat, river otter, mountain lion (in an area of the foothills), and long tailed voles. Most common observations include deer mouse (most common), Trowbridge’s shrew, creeping vole, and raccoon. Fourteen species of amphibians have been recorded using King County wetlands. Although the richness of native amphibians is not great, wetlands in King County are used by a wide variety of amphibians. Western toads, Pacific treefrogs, Northern red-legged frogs, Northwestern salamanders, long-toed salamanders, and rough-skinned newts were all historically common in various wetlands across the county. In more recent wetland studies between 1988 and 1995, the most commonly observed native species were Pacific treefrogs, Northern red-legged frogs, Northwestern salamanders, and long-toed salamanders; least common were rough skinned newts and western toads. One recorded species, the Oregon spotted frog, was not observed during that study and could be extinct in the county. One invasive species, the American bullfrog, has continued extending its range since 1995 and is causing concern as a predator, competitor, and carrier of the highly lethal Chytridiomycosis pathogen as it disperses throughout the county. The most significant finding from our wetland surveys was that no single wetland or group of similar wetlands encompassed the diversity found among all wetlands. In fact, no single wetland exhibited more than approximately 65 percent of the total vegetation, amphibian, bird and small mammal biodiversity found among all wetlands. This finding indicates that each wetland is unique and is instrumental to maintaining the entire regional biodiversity. In general, the regional richness of wetland species in the county remains relatively high although a few species have been noted only sparingly in recent years. Interestingly, the greatest biodiversity for vegetation, amphibians, birds and small mammals has been identified at wetlands owing their more stable hydrology to active beavers and their dams. Invasive species tend to be more common in hydrologically disturbed wetlands in the urban areas of King County and (native) species richness, for mammals and amphibians, in particular, tends to be lower in these same areas. Overall bird richness may have actually increased in some areas (attributable to the increase of generalist and exotic species) but the loss of more sensitive species has probably occurred as the landscape has been fragmented and disturbed. Cross-wetland diversity and within-wetland diversity seems to have declined over the last 150 years in the lowlands of the county as various stages of land development transformed the forests. Land clearing began in the mid-1800s and was followed quickly by agriculture; urbanization in the outlying areas of the county during the last few decades has quickly altered the landscape surrounding wetlands and changed vegetation and hydrologic patterns that support wetland habitat diversity and species richness. This pattern has not occurred in either the foothills or the alpine areas of the county. Therefore these wetlands are less disturbed. Robert Fuerstenberg, Jennifer Vanderhoof, Jonathan Frodge, Kathryn Gellenbeck, Kollin Higgins, Klaus Richter, and Kim Stark collaborated to write the King County Biodiversity Report, which was published by the King County Department of Natural Resources and Parks as part of the Local Action for Biodiversity (LAB) project, a global biodiversity initiative. The report serves as the foundation of a plan for long-term protection of biodiversity in King County. Citation: King County. 2007. King County biodiversity report. King County Water and Land Resources Division, Department of Natural Resources and Parks. Prepared for International Council for Local Environmental Initiatives (ICLEI), Biodiversity Initiative. 102 pp. King County. 2007. King County biodiversity report. King County Water and Land Resources Division, Department of Natural Resources and Parks. Prepared for International Council for Local Environmental Initiatives (ICLEI), Biodiversity Initiative. 102 pp.